# of Pages: 369 p.
In this fourth installment of the Blue Bloods series, Schuyler is on the run with her human familiar, Oliver. She is afraid for her safety since the Conclave refused to believe her story about how her grandfather was murdered in the last book. She is choosing not to choose between Oliver, her best friend, and Jack, whom she believes might be her soul mate. Bliss is struggling with the loss of her mother and sister, while attempting to take control of her own mind from the “visitor” who sometimes chooses to take over her body and perform terrible deeds. After the attack on the blue bloods in the last book, everything seems up in the air and no one knows exactly where they should turn for support. Mimi and Jack are each avoiding the fact that they were somewhat relieved when their bonding ceremony was postponed. Can the blue bloods fight the silver bloods if they do not know who they are really fighting? Or what the plan of attack will be? 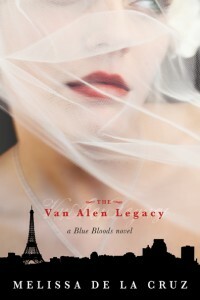 Will Schuyler be able to save the blue bloods through the Van Alen Legacy? There are many things going on in this book, which made it move quickly. At the same time, there was so much going on that sometimes important elements to the plot were revealed and they did not seem to get the shock they deserved because there was too much going on around it. The characters are still strong and the readers will want to know what happens to each of them. Of course, this book sets up another book to follow with many questions unanswered and people in limbo. Students who have followed this series from the beginning will enjoy the book, but may be somewhat frustrated that more has not been resolved. As the target audience grows up, they will fail to continue to follow this series.